Manual Applications are invited prescribed proforma for the following posts of School Education & Literacy Department Government of Sindh to be filled through Competitive Examination. 07 POSTS OF ASSISTANT ENGINEER BPS-17 (ELECTRICAL) EDUCATION WORKS (04 RURAL, 03 URBAN). i. B.E. (Electrical) at least in 2nd Division from a recognized University. ii. Registered as a professional Engineer with Pakistan Engineering Council. 46 POSTS OF ASSISTANT ENGINEER BPS-17 (CIVIL) EDUCATION WORKS BPS-17 (28 RURAL, 18 URBAN). 35 years in the case of the Sub-Engineer serving in the Directorate of Education Works, School Education, and Literacy Department, but such Sub-Engineers shall be eligible to compete only once. B.E. (Civil) at least in 2nd division from a recognized University. Age relaxation in upper age limit for vacancies in all departments is subject to Policy / Notification of the Government of Sindh whereas there is no age relaxation in Police Service and the posts to be filled through Competitive Examination i.e Engineering Cadre by Sindh Public Service Commission. 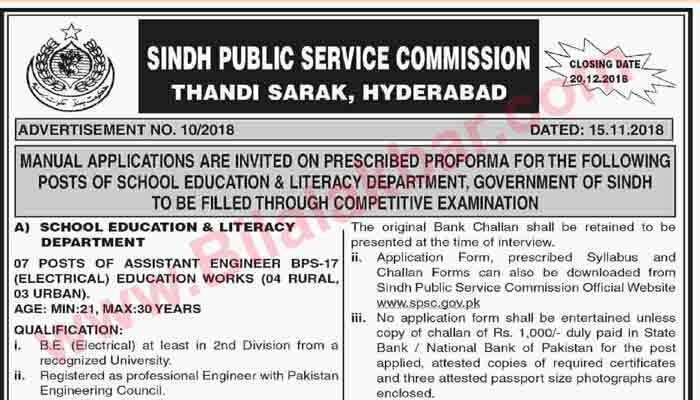 Application Forms & prescribed syllabus will be issued by the Sindh Public Service Commission, Head Office, Thandi Sarak, Hyderabad and Regional Offices. 2nd Floor, Sindh Secretariat Building No. 06, Karachi. Bungalow No. 156 Friends Co-operative Society Akhwat Nagar near Gol Masjid, Airport Road, Sukkur. Commissioner's Secretariat, Opposite Shaikh Zaid Hospital, Larkana. Candidates are required to pay the examination fee of Rs. 1,000/- (Rupees One Thousand only) through challan in the Head of Account "CO2101-Organ of State-Exam Fee (SPSC Receipts)". The copy of paid Original Challan should be submitted along with all relevant documents on or before the closing date. The original Bank Challan shall be retained to be presented at the time of interview. Application Form, prescribed Syllabus and Challan Forms can also be downloaded from Sindh Public Service Commission Official Website www.spsc.gov.pk. No application form shall be entertained unless a copy of challan of Rs. 1,000/- duly paid in State Bank / National Bank of Pakistan for the post applied, attested copies of required certificates and three attested passport size photographs are enclosed. The Commission under no circumstances shall be responsible for non-receipt or late receipt of any posted letter(s). Candidates residing abroad can apply on plain paper giving Age, Qualification, Domicile, PRC on Form D" and three attested passport size Photographs along with all supporting documents. They shall be required to produce original Challan of Rs. 1,0001- (Rupees one thousand only) duly paid in any Branch of State Bank / National Bank of Pakistan at the time of interview as well as prescribed application form duly completed in all respects. The number of posts is subject to variation without any prior notice. The candidates should have required age and qualification on the closing date. Age shall also be reckoned on the basis of closing date. Option (e.g. Domicile, Age Qualification, Centre and optional subject etc) once exercised shall not be changed at any subsequent stage. Applications should reach the Head Office of Sindh Public Service Commission, Thandi Sarak, Hyderabad or any of the Regional Offices of the Sindh Public Service Commission on or before the closing date up to 05:00 p.m. (office hours). No extra time will be allowed for postal transit etc. Applications received after closing date shall not be entertained. Other details can be seen in.